Chicken wings make a great snack for game day parties or tailgating, but they also make a terrific everyday main dish. Take a look at these recipes that are prepared in the slow cooker or slow baked in the oven for an easy meal. Make one or all four of these sauces to serve with them. If you make chicken wings as an entree, add fries or roasted potatoes and your favorite vegetable salad. Classic slaw and broccoli salad are excellent options or serve them with a variety of raw vegetables. Celery sticks, sliced cucumbers, and carrot sticks are great with spicy wings. Do not forget your favorite dipping sauces and supply plenty of napkins. Serve these great-tasting honey garlic chicken wings with a mustard dip or jarred sweet-and-sour sauce. You can also boil the marinade and use it for dipping. These are great wings to serve as a party snack or as part of a family meal. Spices, garlic, lemon juice, and a simple honey glaze flavor these delicious Cajun-style chicken wings. The wings are marinated for 4 hours so plan accordingly. 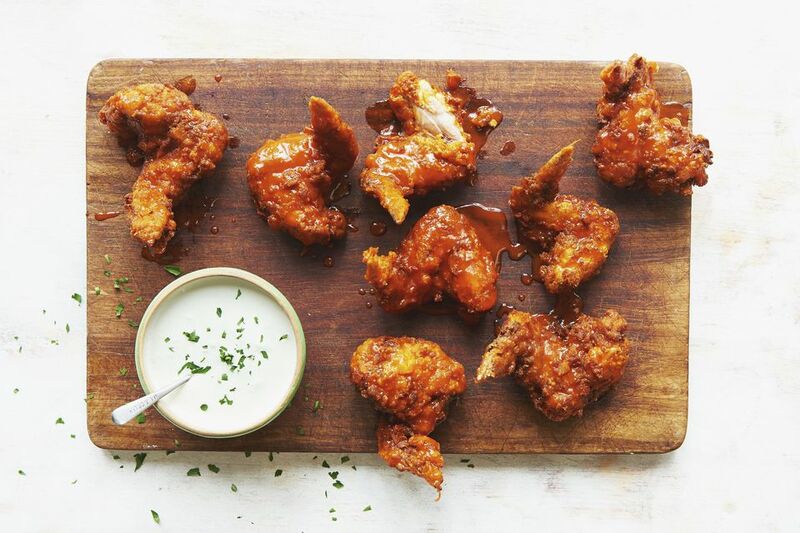 A spicy Louisiana remoulade sauce would be ​a great accompaniment to these wings. This great-tasting, homemade spicy Jack Daniel's barbecue chicken drumettes recipe has a nice kick. Sriracha sauce adds nice heat to the sauce, but cayenne pepper, a chile garlic paste or another hot sauce could also go well, too. Keep tasting as you add heat to make sure you do not go overboard. These flavorful sesame chicken wings are marinated in an Asian-style sauce and then they're baked to perfection. Serve them with a sprinkling of sesame seeds or sliced green onion tops for a tasty snack or main dish. These wings go well with steamed white rice or Asian flavored noodles. These baked buffalo chicken wings are delicious with a blue cheese dip or use a blue cheese dressing or ranch dressing. To make hotter wings, add extra Tabasco to the sauce or cayenne pepper. These baked chicken wings are tossed in a spicy Asian-inspired peanut sauce, then they're served with more of the sauce on the side for dipping. A spicy chile garlic paste or sambal provides the heat in the tasty peanut sauce. These great-tasting hot-and-spicy chicken drumettes pack a punch and are perfect for parties, tailgating, picnics, and family meals. Baking makes them a little lighter than the deep-fried version. The herb and flour coating makes them crisp up nicely in the oven and marries perfectly with the buttery, spicy sauce. Terri's delicious Cajun chicken wings are made with lots of Tabasco, peppers, and butter. They're marinated then baked until golden brown. Make these wings to serve with your favorite dips at any party or gathering. 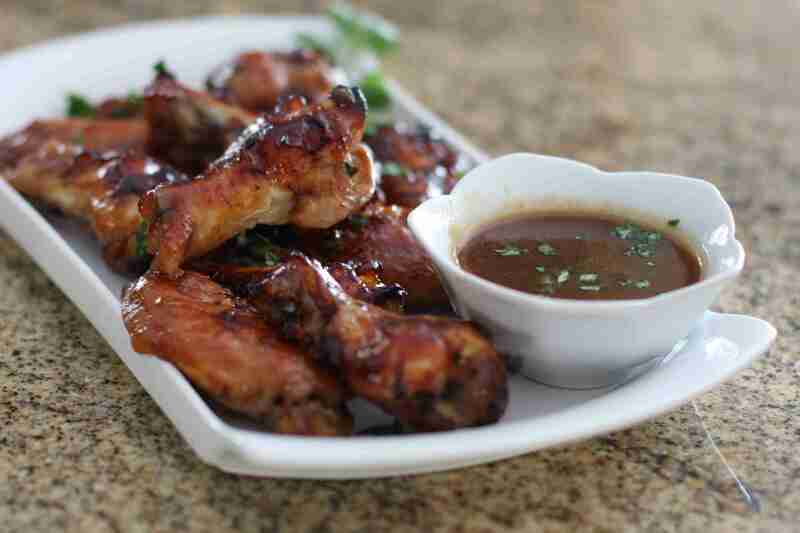 Maple syrup, garlic, soy sauce, and teriyaki sauce flavor these delicious spicy maple chicken wings. They are easy to prepare and bake and need no advance preparation. If you crave sweet, sticky wings, this recipe is a great choice. These tasty spicy glazed chicken wings are made with a soy sauce, sherry, and spice glaze. The wings are marinated for 3 hours before baking. Serve with some finely chopped green onions. Garnish with sesame seeds. These easy broiled barbecued chicken wings are made with a homemade sauce mixture that makes for a great meal or snack for a family. Feel free to double or triple the recipe for a holiday appetizer or game-day snack for a bigger crowd. These delicious spicy slow-cooker chicken wings are made with honey and your favorite barbecue sauce along with Tabasco and other seasonings. This recipe makes about 30 pieces and is easily doubled for a party. Ginger, garlic, honey, and soy sauce make up the sauce for Linda's slow-cooker chicken wings. Serve these popular chicken wings with vegetable sticks and your favorite dips. These easy spicy baked chicken wings are baked to perfection with a buffalo-style sauce. Add extra cayenne pepper to the sauce for more heat, and serve them with celery sticks and blue cheese dip or ranch dressing. These easy slow cooker teriyaki chicken wings are broiled until they are browned, and then they are combined with a flavorful sauce in the slow cooker. Add some sambal or crushed red pepper flakes if you want some heat. The recipe is easily scaled up for a crowd. Make them for a game day party or tailgating event. Remoulade sauce: This basic remoulade sauce makes a delicious topping for burgers or use it as a dip for wings, fried fish, or chicken nuggets. Chipotle mayonnaise: Use this flavorful spicy chipotle mayonnaise as a dip for chicken or fish or as a sandwich or burger spread. It is quick and easy to prepare, with a few chipotle chiles in adobo sauce, mayonnaise, and other ingredients and seasonings. Creole mayonnaise: This sauce, made with mayonnaise, Creole mustard, and Cajun seasonings, makes a great dip for Cajun-style chicken wings. Mustard-mayo dip: This simple, tasty dip is made with mayonnaise, dill, and mustard.